The biggest Vacuum sealed household container in the world! Simply Amazing, This Black Coffeevac will double if not triple the shelflife of all light sensitive goods. Will also store 5+ pounds of Coffee beans & ground Coffee, 5+ pounds of Tea, Pasta & cereals, 10 pounds of rice, flour,& brown sugar and all your bulk items that often spoil before you use them. Simply line the arrows with the buttons on the side of the Coffeevac and push down or pull off - The Coffeevac has a locking handle - Twist right to lock - Twist left to unlock. The Coffeevac is made from European Union - EU approved recyclable, Food Grade polystyrene # 6 plastic. 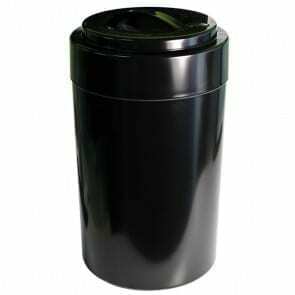 Approximate dimensions = 14" inches (tall) X 8.5" inches (wide) or 35.6 centimeters (tall) X 21.5 centimeters (wide) ROASTERS -Eliminate Bags! This is the only Sustainable 5 LBS Vacuum sealed Container!